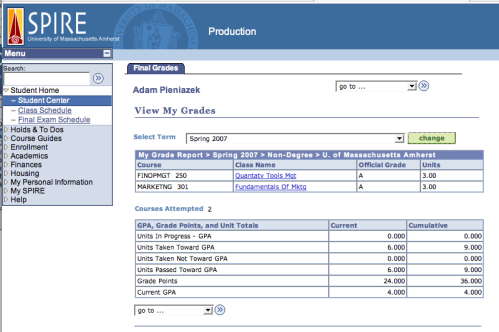 I just went and checked the grades section on my SPIRE account on the University of Massachusetts at Amherst web-site and my official grades for the Spring 2007 semester are posted. 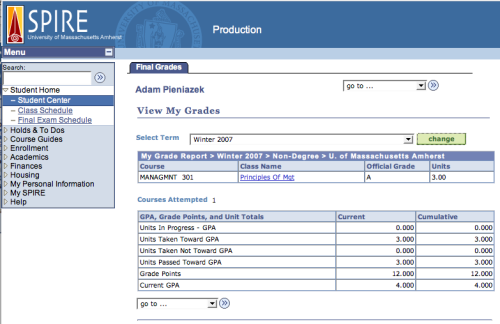 A 4.0 GPA for the Spring ’07 semester! I got an A in both courses, Fundamentals of Marketing and Quantitative Tools for Management (aka Statistics II) during this semester. Pretty awesome, eh?